I'm sure I've mentioned it many times here on the blog. I think I've even talked about how freshman year I'm pretty sure I was the only person on my dorm floor to have cable TV. College freshman are usually poor but somehow I found money to pay for cable television because clearly it's a necessity in life. And by finding money I mean I asked my dad and he paid for it because he also believes in the power of cable. I just love getting caught up in a good show, it's sort of an escape for a little bit. And I might add that I get a little too attached to shows and characters. This could be a flaw of mine. Netflix is like a dream for a TV acholic like me. Being able to binge watch TV shows and find new shows to love and watch from the beginning to end? TV heaven. Well tonight on Facebook a good friend of mine who also shares my love for television asking a profound question that got me thinking. She said she and her husband had been discussing their top 5 favorite shows and she posed the question "what are your top five favorite shows?" This was hard for me because clearly I have a lot of favorite TV shows, but I decided to go with the shows that came to my mind first. I also felt if a show was going to be on my list it needed to be one that I could (or have) watch from the beginning to end over and over. I cannot explain my love for this show. It is cheesy and unrealistic and sometimes the acting is pretty bad.....but I absolutely love this show. Sidenote: I recently read that Shonda Rhimes was the writer of Crossroads the Britney Spears epic film. I was SHOCKED. If you haven't watched this show start it immediately. I think it's a show that everyone loves. Clear Eyes. Full Heart, Can't Lose. So I'm kind of shocked that I'm including this show on my top 5. I knew I loved it but I didn't realize I loved it with a top 5 kind of love until I decided that is where it belonged. This is another show I started in college. In fact a group of girls and I would meet together on Sunday nights where we would have bible study and then we would watch Desperate Housewives together. Not on of my finer moments in my spiritual walk. It's not the most conservative show, but I feel like it goes deep on a lot of topics and doesn't stay surface level. Plus it's really funny and the early years were so well-written. Have you ever watched Reba? Hands down one of the funniest shows ever. It was highly underrated and I blame this on the fact that it wasn't on a primtime channel. Is CW considered primetime? I don't think so. I still watch reruns all the time and laugh out loud every single time. Dawson's Creek - just because. Who doesn't love Dawson's Creek. 5.....I actually can't remember and he's asleep and I doubt he would want me to wake him up just to get the answer. So now I have to ask what would your top five shows be? Go with what comes to your mind first! I'm so intrigued. And maybe I'll find a good show to watch. Or re-watch. Or maybe I just need to quit watching so much TV. I LOVED Reba when it was on the air, I watched every episode! They have the re-runs on ABC Family and I have recorded all of them (my DVR is like 50% Reba lol). Also George Lopez is a good one, not as good as Reba but I've been watching re-runs on Nick at Nite and it's pretty funny. Right now my very favorite show ever is The Walking Dead. It is very violent, so it's not for everybody, but I absolutely love it. I'm really attached to the characters, first show that I have ever been that way about! I don't have netflix, so once a show is over, it's over for me. Gilmore Girls, parenthood, Downton Abbey, Alias, and this one is kind of embarrassing, but it has sentimental value because I used to watch with my grandfather, Star Trek. 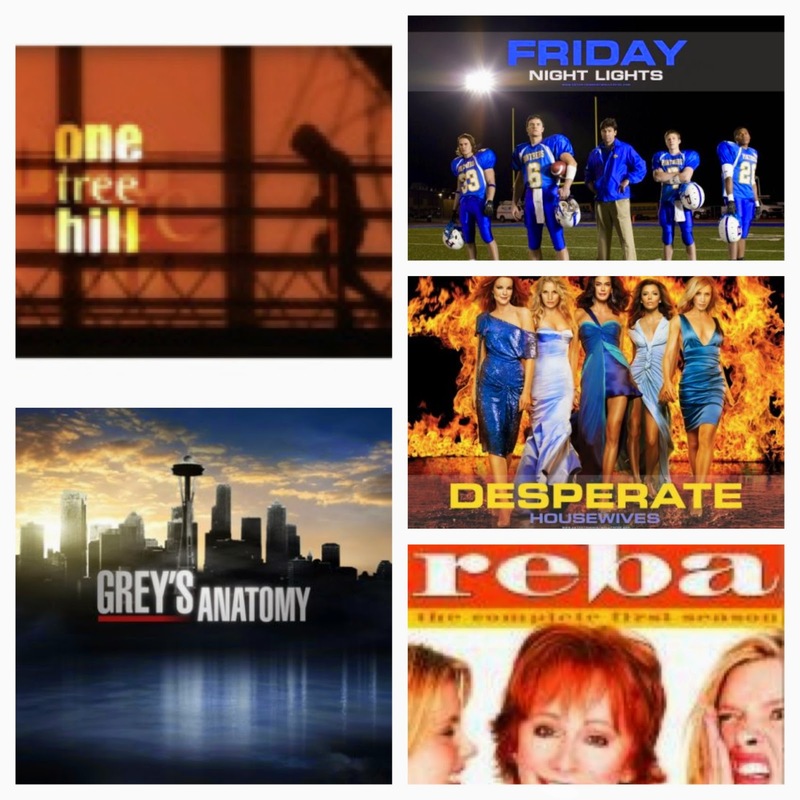 One tree Hill, Grey Anatomy, Friday night lights, Friends, and Gilmore girls! Love them all and could watch them over and over again. I also would add dawsons creek as honorable mention as well as Army wives because its also a fav but there are only Five spots LOL!!! My husband's would all be 80s shows too probably and could probably be very similar to Luke's! Sidenote - I have started Friday Night Lights 2 or 3 times and can't get into it. Which is terrible to say because it's filmed in my hometown, my H.S. coaches are extras, they used footage from my H.S. 's football team games, copied our uniforms...everything and I just can't get into it! Based on Luke's list he hasn't watched TV in more than ten years! Ha! Or he just loves the oldies! 1. Friday Night Lights-the best ever!